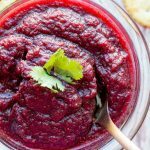 This cranberry salsa is tangy, zippy, sweet, spicy, easy to make and everything you could ask for. You guests will devour it and ask for more. Combine cranberries, cilantro, onion, jalapeno, lime juice, sugar, ginger and salt in a food processor. Process to desired consistency. Refrigerate if not using immediately. Best if served at room temperature. Serve with cinnamon tortilla chips, crackers, graham crackers or pita chips. You can also serve over non-dairy cream cheese.